Turn your 18" or 24" Super Jig into a superb box joint jig! Finger joints, also called box joints, add visually striking symmetrical design and amazing strength to any corner assembly. All Leigh Super Jigs can produce 5/16” and 5/8” finger joints using the standard dovetail finger assembly. Now, with a Leigh Finger Joint template mounted on your 18” or 24” Super Jig, you can rout an additional six sizes of finger joints; 3/32”, 3/16”, 3/8” 1/8”, ¼” & ½”. An additional two sizes, ¾” and 1”, are easily routed by following a procedure in the User Guide. But it doesn’t stop there. A Leigh Technical bulletin includes instructions to rout double and triple size joints, all with the same incredible accuracy. That’s 12 sizes in all! Rout the perfect sized joint to suit any woodworking project. With the template mounted on your jig, and board clamped in jig, simply guide your router around the template comb to rout the box (finger) joints. Then reposition the template, so the mating board can be routed. It’s so easy! 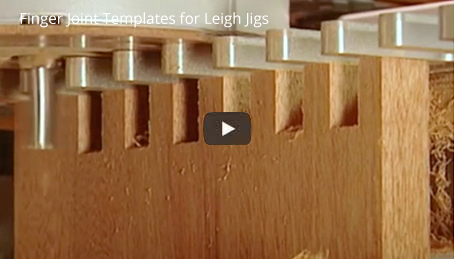 Leigh has made perfect joinery easy in every way, from thorough, step-by-step user guides and bulletins, to how-to videos. Leigh’s customer service is second to none, with instant toll-free technical support. What Router Should I Use? Leigh recommends a midsize router, from 1-1/2 to 2-1/4 HP (9-13 amps) with a 1/2” collet. This size provides great power to weight ratio. Fixed base routers are ideal because they have a lower center of gravity with handles mounted to the router base rather than the motor, as with plunge routers. However, if you are proficient with the use of a plunge router, it works just as well. The F18, F18M, F24 and F24M requires a router with a 1/2" collet, and smaller bits require the use of a collet reducer.